Sharing the pretty box my husband made. 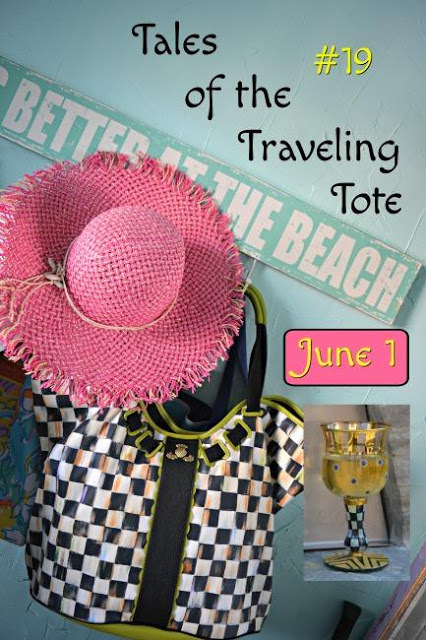 I love to use it for seasonal holidays. It sits on our dining room table. You can find the tutorial here. The fall kitchen vignette is below. There a lot of boxes out there, but as I said before, I wanted an elegant look to ours. So the feet and a decorative piece were added. Battery candles complete the look! 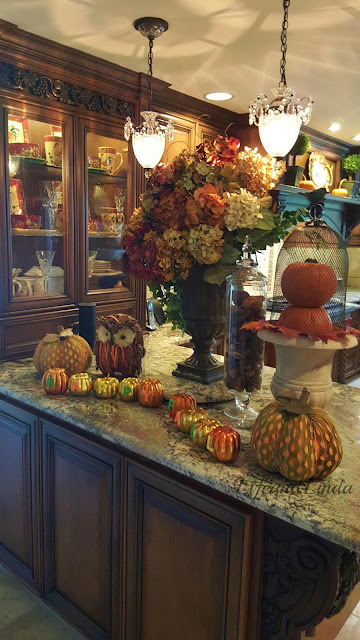 I created a fun Fall vignette on the kitchen buffet area. 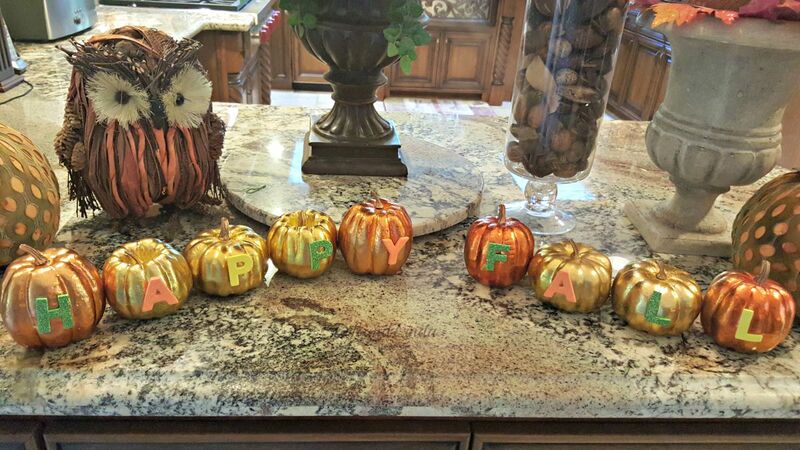 Small metallic pumpkins spell out the words, Happy Fall. A cute owl from Pier1 sits near another fabric covered pumpkin. Pumpkins piled into an urn with a bird wire cloche. Another Fall vignette sits on a shelf on our entertainment center. The tv sits below. Thank you again for your thoughtful words and prayers. Still continuing on with the dance classes. I will be volunteering to dance with a small group at two assisted nursing homes. A little entertainment for those who live there. 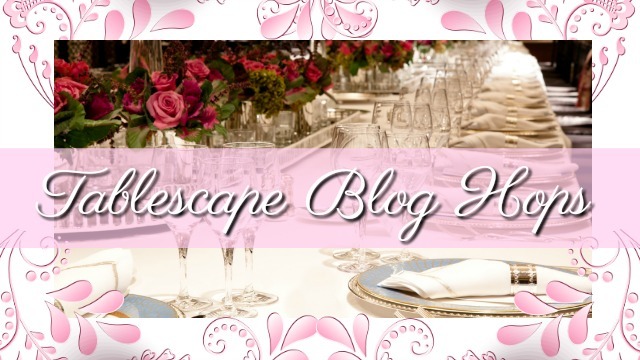 Don't forget I have my tablescapes in Seasonal categories. So your husband is artistically creative too, I see! Lovely! Yes he is Debra. thanks so much. We make a great team. So beautiful with all the rich colors of autumn! Have happy Fall day tomorrow!!!!! 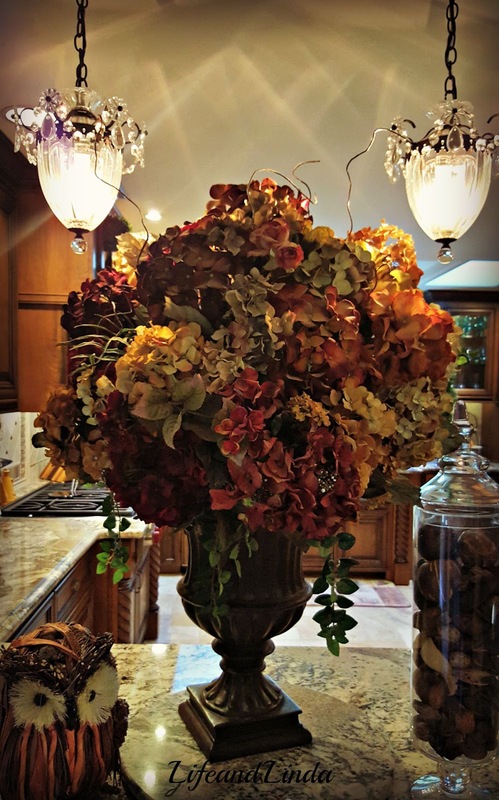 Your fall touches look beautiful Linda! You ae a child at heart..I love that harvest box..any holiday! 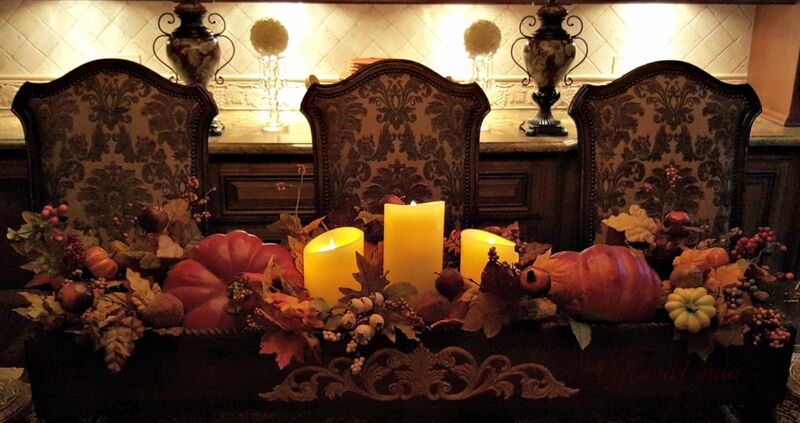 Beautiful fall touches! I am in love with that box you two did. Very elegant! Linda, your box is lovely! I love the embellishment you added; it really adds such an elegant touch to it! 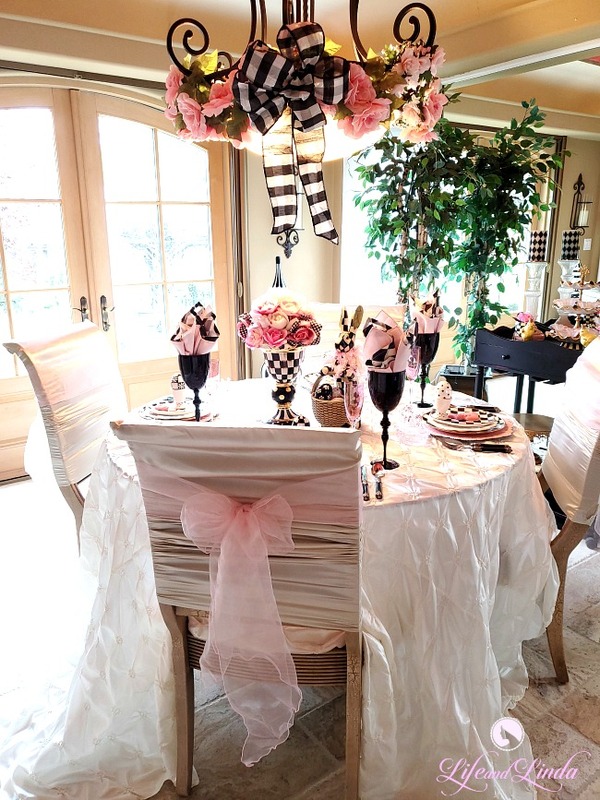 Your kitchen vignettes are so pretty and festive! I can't keep my eye off of your lightening; it's stunning! You have such a beautiful elegant home; the Fall decorations you have added are perfect for it! So happy your son is home! 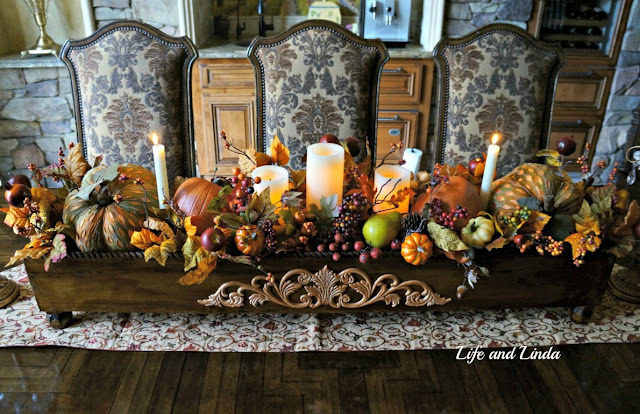 Hi Linda, Love all your fall decor and that table box is gorgeous. I love it with the candles and this is something I would love for my hubby to create for my table. You have inspired me. 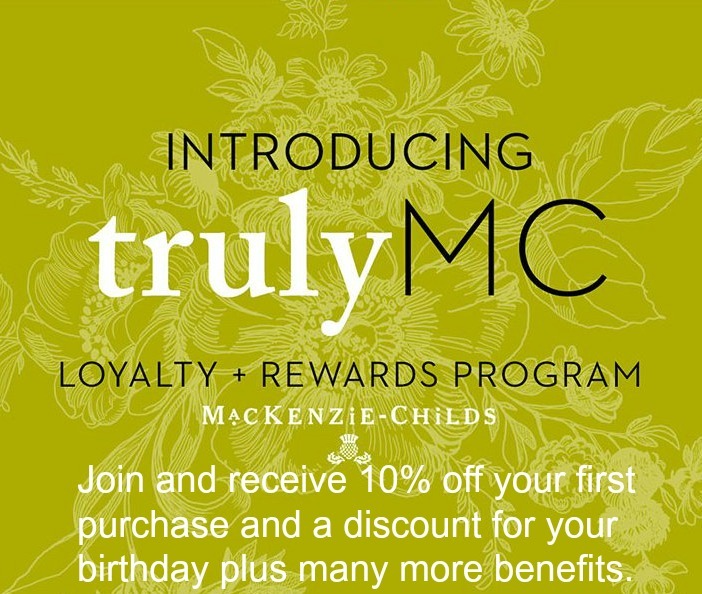 Your home is simply gorgeous and always magazine ready. So glad your family is safe and your son back home. As always, your home looks so very elegant...absolutely perfect. Happy Fall. I have the box that my hubby made the December before he passed away, always on my dining room table. I change the decor in it for the seasons, too, and think of him. All your vignettes look so pretty, Linda. Keep on dancing, my friend! 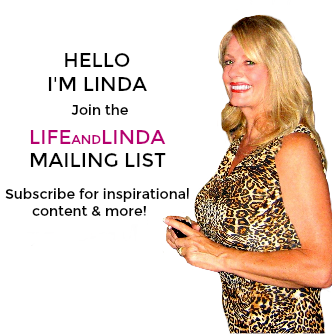 I simply love everything, Linda! 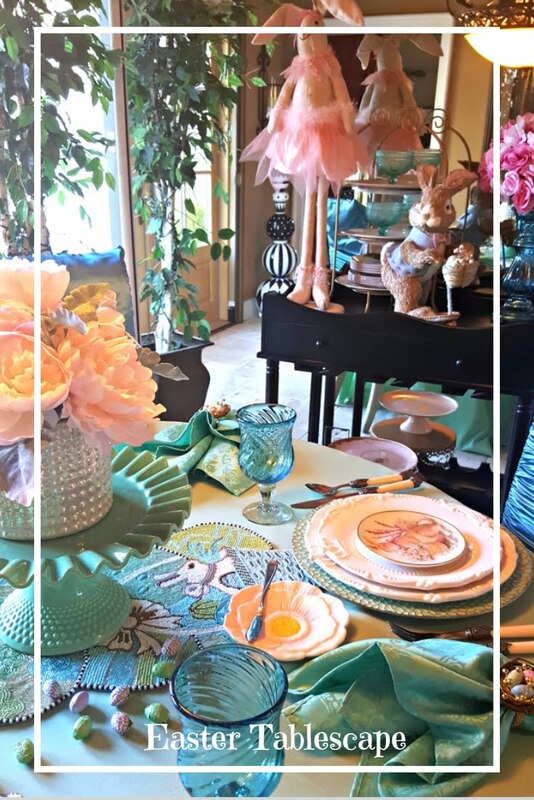 From the box of festivity to the owl---I saw that at Pier 1!! Everything is elegant and beautiful, as always, Linda. Love the candles in the center of your beautiful box, and your massive urn arrangements. You always do such beautiful work. Autumn is such a beautiful time of year and your home really reflects it. Your kitchen is just lovely! 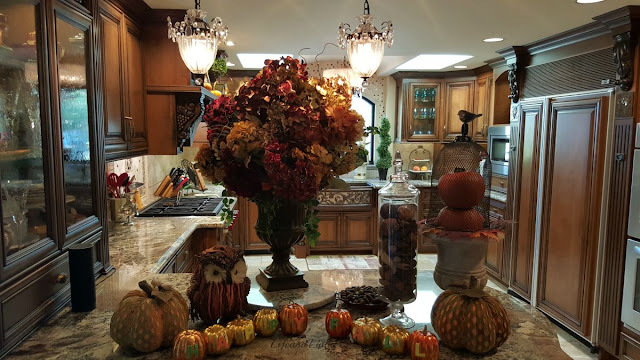 And your fall decor in there gives you such a happy space to help restore your spirits after what your family has been through with the fire and accident. Those sweet cozy beautiful things do help, don't they? It's important, even vital, to create a little piece of heaven in our homes. I love the box hubby made for you and you decorated it beautifully! The kitchen buffet area looks great! 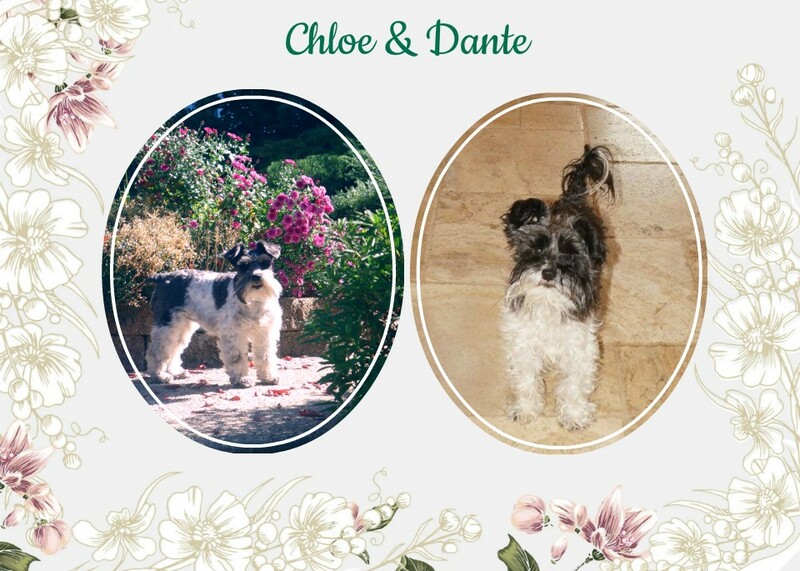 Love the vignette you created. That arrangement above the tv is cute! Love how the lights highlight the vignette! So glad your son's home was spared among all the devastation that occured. At least he had one bright light at the end of the tunnel. I hope they can work out that car accident situation with the insurance company a little bit better. 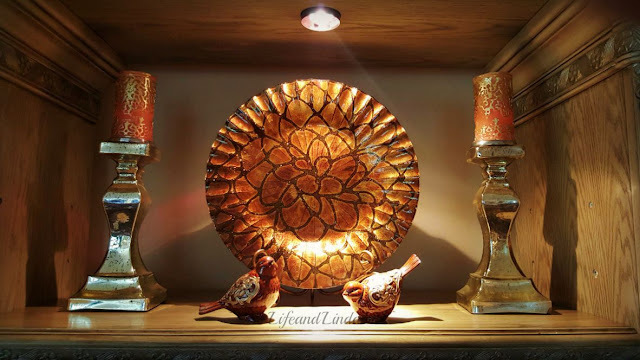 Isn't it always more enjoyable to decorate when we are able to incorporate pieces that our loved ones have made for us or even given us. Brings such a meaningful touch. Your husband and you are both so talented and create some beautiful spaces together, this one is no exception! Your home is so elegant, lovely and picture perfect. I am thankful that your family is safe and that your Mother's heart can rest some. Next to Christmas decorating, I think Fall is the best. Everything looks so beautiful, Linda. Your pics are great Have you been practising? lol. It's such a warm and cozy time of year, isn't it? Time to snuggle on the couch and enjoy the fire with a glass of wine. Enjoy your weekend! Just beautiful! Fall is my favorite season and you have captured the essence of it. Love the tall flower arrangement! Linda that is such a cute box, I love the extra added details like the little feet and trim, the color is perfect for fall decorating. I have been looking for something similar and I will not rest until I find one. Oh Linda I'm drooling over your kitchen!! 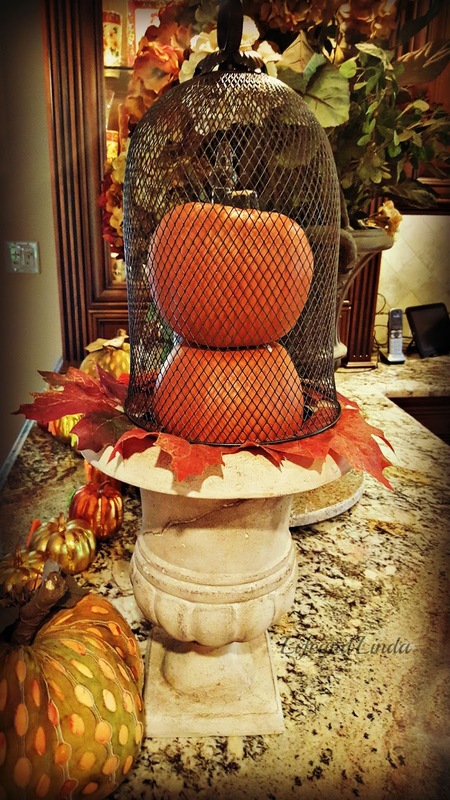 It's gorgeous and your fall decor dresses it perfectly for fall! Thanks for giving us great ideas to enhance our homes.